McLaren have unveiled the all new 570S Spider, as far unparalleled in the realm of luxury convertible motoring. The stunning new Spider has the looks and performance to blow you away. Match this with the exhilaration of a fully convertible sports car, and you’ve got a truly astounding motor. The 570S will make its debut appearance at the Goodwood Festival of Speed on the 29th June this year. The 570S Spider sports a fully convertible two-piece roof, engineered using technology proven in the McLaren 650S and 675LT Spider. Neatly integrated for a touch of class, the retractable hardtop looks great, come rain or shine. The new Spider’s sleek profile is beautiful whether the roof is raised or lowered. When the roof is lowered and the Spider unleashes its raw power, the convertible offers an intensely immersive driving experience. The Spider’s retractable roof is a component born of simplicity and elegance. Composed of lightweight composite panels, it operates using one simple control within reach of the driving seat. At the push of a button, the hardtop folds effortlessly beneath a graceful tonneau cover. The cover rises automatically to accommodate the lowered panels and uses soft close technology to stow them away. The roof can be easily lowered or raised in just 15 seconds at speeds of up to 40km/h (25mph). A glazed wind deflector can also be controlled at the push of a button for enhanced versatility. With the roof lowered, the deflector reduces wind-buffeting. It can also be lowered when the roof is up to let a breath of fresh air into the Spider’s cabin. The elegant hardtop has been specifically designed to look great for years to come. The hardtop is more weather and fade resistant than fabric, and can withstand severe weather conditions. Amazingly, the roof’s operating mechanism adds a mere 46kg to the Spider. It’s the only variance weight between the new Spider and the 570S Coupé. The 570S Spider gives ‘sleek’ a whole new meaning. Smooth flowing contours meet distinctive side panels and an impressive spoiler in the new model. The headlights and rear lights are beautifully crafted and give a hint of the ferocity of the Spider’s engine. A new rear spoiler, 12mm taller than that of the 570S Coupé and finished in Dark Palladium grey, adds a final flourish of sporty showmanship. The cabin puts the driver right in the middle of the action, with all controls within easy reach, including the retractable roof. A 7-inch RIS touchscreen infotainment system and a 10-inch TFT main instrument cluster are centrally positioned for ease of access. Exceptional craftsmanship comes in the form of hand-stitched leather seats, dashboard and door casings. Some optional extras are available to finish off the exquisite interior. Standard six-way adjustable electric memory seats can be swapped for eight-way seats with Nappa leather or performance-oriented Alcantara® trim. Customers can also specify lightweight carbon-fibre-shelled sports seats, the same as those fitted to the McLaren P1™. The all-new Spider is rocking some all-new shades for its debut. Curacao Blue, Vega Blue and Sicilian Yellow have been added to the existing Sports Series selection. With 20 shades to choose from, the Spider offers a range to suit customer preference. Optional Dark Palladium grey can be added as a contrast to finish the roof, rear buttresses and windscreen pillars. 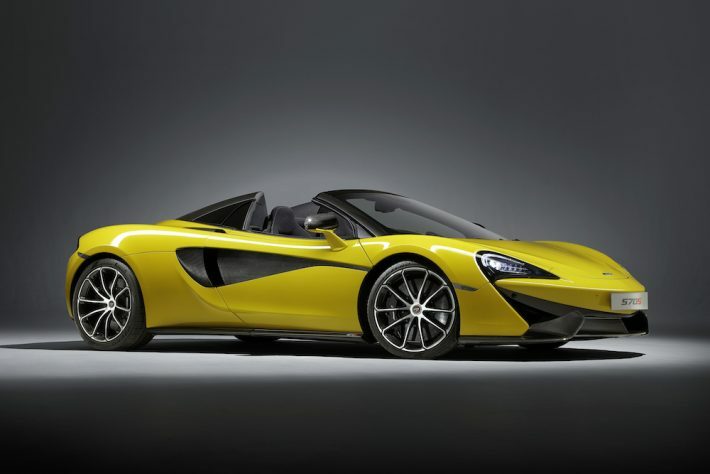 Down on the ground, the new 570S Spider showcases optional 10-spoke lightweight alloy wheels. The trims cover 19-inch front wheels and 20-inch rear. For a further custom finish, brake callipers are available in a new Liquid Black colour. 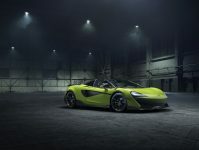 The great news for any McLaren fan is that the Spider convertible has suffered no losses in performance. Compared to the 570S Coupé, the 570S Spider still offers rip-roaring performance. For those who want to enjoy the skin-tingling engine notes on offer, an optional sports system that features an ESG to channel exhaust sound towards the cabin is available. The carbon fibre MonoCell II chassis, at the heart of all Sports Series cars, is still going strong in the convertible. Lightweight carbon fibre engineering paired with a raging 3.8-litre twin-turbocharged McLaren V8 engine puts the Spider ahead of the game. It is both lighter and more powerful than other comparable convertibles, and sports an impressive power-to-weight ratio of 419PS-per-tonne. The McLaren M838TE engine produces 570PS at 7,500rpm and torque of 600Nm between 5,000rpm and 6,500rpm. A seamless-shift, seven-speed gearbox featuring Launch Control technology adds an extra touch of effortless elegance. 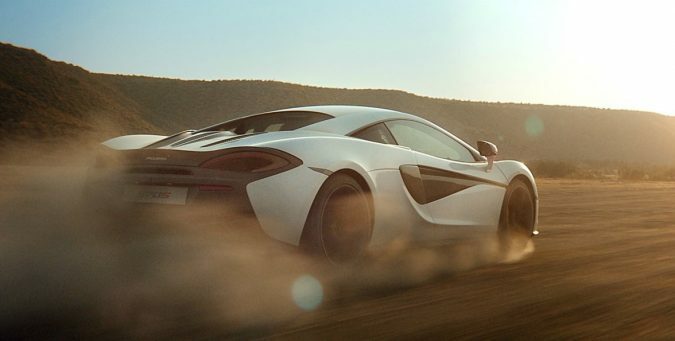 The 570S Spider roars from standstill to 100km/h (62mph) in an astounding 3.2 seconds. 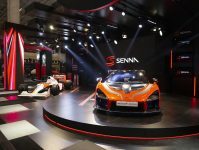 It can hit heights of 200km/h (124mph) in as little as 9.6 seconds. With the roof raised, the Spider matches the 570S Coupé’s top speed of 328km/h (204mph). With the roof lowered, it still belts out an impressive 315km/h (196mph). A stop-start engine system also means it’s ahead of the game with fuel efficiency, hitting 10.7 litres/100km (26.6mpg) in the NEDC combined cycle. CO2 emissions are equally impressive at just 249g/km. 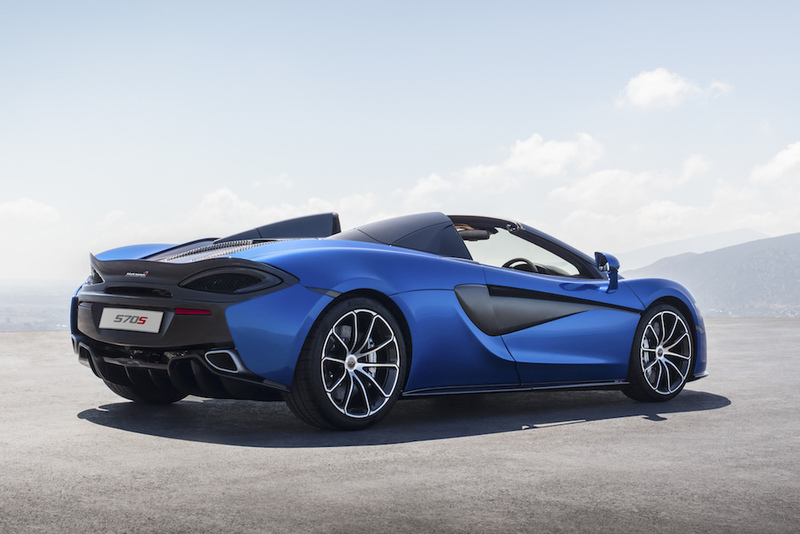 The new 570S Spider has double-wishbone suspension all round. 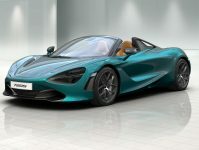 It’s kitted out with steel springs, twin-valve adaptive dampers and anti-roll bars calibrated to the same exacting specification as the 570S Coupé. Softer or firmer suspension can be accessed through the different driving modes, including Normal, Sport or Track. The versatility of these driving modes means that the new Spider is just as at home on the racetrack as it is in everyday use. The Spider also has some impressive ‘comes-as-standard’ kit. 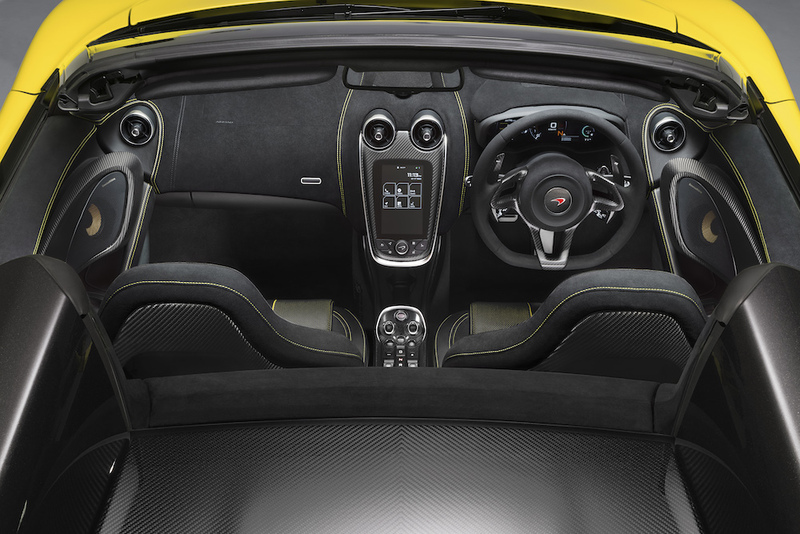 Electro-hydraulically assisted power steering, carbon-ceramic brakes and Pirelli P Zero Corsa tyres are all included. The latest chassis software enhances driving experience and safety. If you’re headed to the racetrack, the 570S Spider has a few tricks up its sleeve. Brake Steer aids originally developed for Formula 1 help with cornering and reduce understeer by applying brake force to the inside rear wheel when cornering. 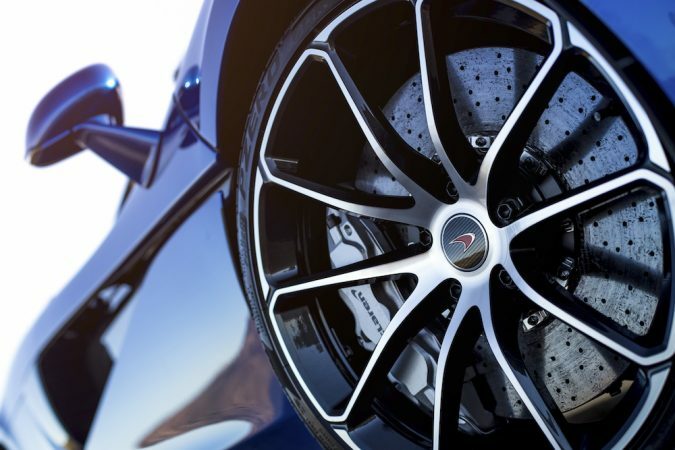 Precision comes easily with Performance Traction Control perfectly calibrated by McLaren. An Electronic Stability Control (ESC) system also comes with a Dynamic mode. This reduces intervention and allows the Spider to drift more easily. 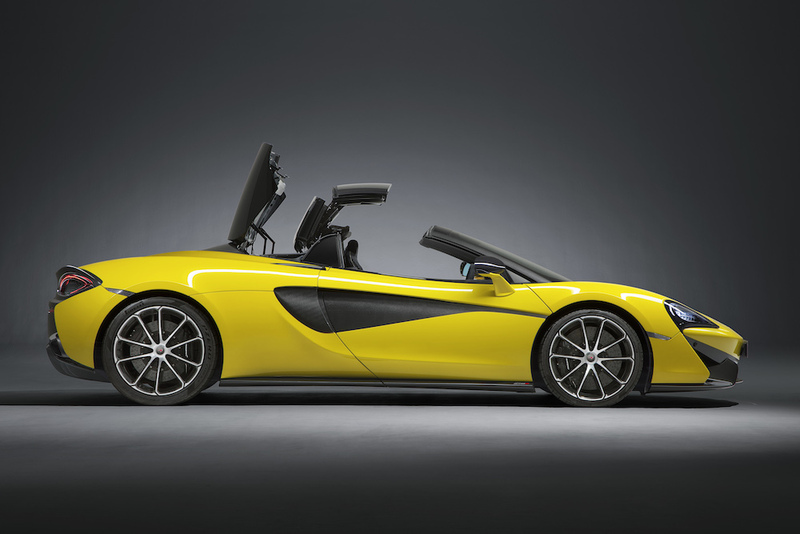 The all new McLaren 570S Spider is available to order now from over 80 McLaren retailers worldwide. 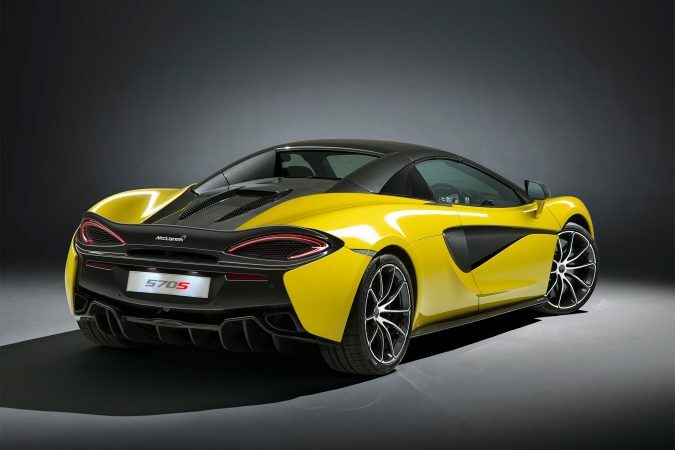 Each 570S Spider is hand-assembled at the McLaren Production Centre in Woking, England. The first cars are scheduled to be delivered to customers in August, and are priced from £164,750.